Let’s say you are getting ready to take off for the African Safari of your dreams. Naturally, you’ll want to make sure you have a great camera and lens to capture all that spectacular scenery, but you don’t want to blow you budget before even checking your luggage. Renting is a great option for high-end camera items you want for vacation or a freelance assignment but don’t really need to own. Here’s an example. Let’s say you wanted a telephoto lens for the safari. A zoom that brings the animals closer to you will require a bit more power than you have in your camera bag. Nikon has an 80-400 mm lens that is not super fast, but it will get the job done. Buy that lens, and be prepared to part with $1,599. You can rent the same lens from CameraLensRentals.com for $97 for two weeks. RentGlass.com will let you borrow it for $88 for two weeks. If you prefer the local option, Penn Camera will also rent for $40 per day. That’s a bit more expensive than the others, but Penn will let you apply half the rental fee toward the purchase of a new item. That might be a good option if you think you might want to buy the lens at a later date. The BorrowLenses.com process is fairly typical. You’ll want to inquire about security requirements, as that can vary. For instance, LensRentals.com requires a short process to verify the identity of first-time renters. They say it can take a few minutes to 48 hours to give you the green light. On the other end of the spectrum, Penn Camera asks for a deposit to cover the cost of the item. In the example of our 80-400 mm lens, Penn will require $1,000 either in cash or on a credit card, which is returned at the end of your rental. You can’t beat the opportunity to vacation with a $1,600 lens for less than $100. That’s why renting is always a great option for lenses you won’t use often. I’d get the great shots with my 80 - 400 mm rental and use the other $1,500 to find some other cool things to shoot. You can rent lenses for your digital or film SLR camera shipped to you via FedEx or USPS mail! We’re a family-run business of used-to-be semi-pro photographers. Roger Cicala, the founder and CEO, was located in a mid-sized city far from the major camera stores. There was nowhere to rent a top quality lens locally (actually nowhere locally to even buy a good quality lens). He couldn’t find a mail order rental house that met his simple needs: get me the equipment I want, when I want it, in great condition and at a fair price. Since no one else was doing that, he decided he should and started LensRentals as a “Photographers Co-op” in June of 2006 with about 30 lenses so he gets credit for the idea. In the last 4 years Lensrentals.com has grown from startup to the largest photographic equipment renter in the U. S. We’re convinced we accomplished that in a very simple way: by offering better selection and customer service than anyone else. Our mission for 2011 is to focus on improving both of those areas even further. We believe if we do that everything else will take care of itself. 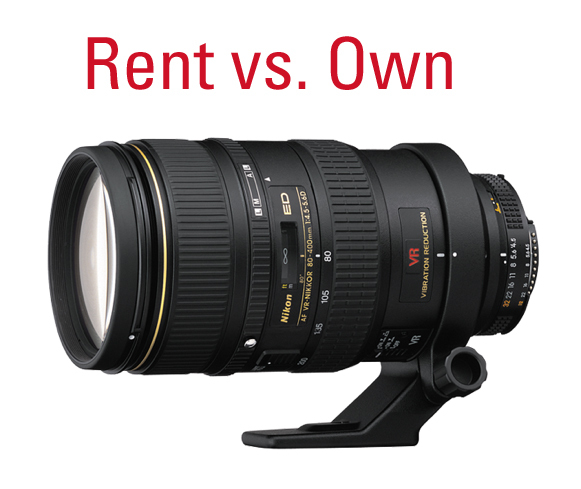 Camera Lens Rentals offers a wide range of Canon, Nikon, and PENTAX series lenses and bodies to rent for your film or digital needs. We rent some of the finest lenses and bodies that each has to offer. Whether you're a professional, amateur, or someone just looking to try a new lens or body, you have come to the right place. We offer all types of lenses and bodies for all your rental needs. Penn Camera has the largest inventory of rental equipment in the Mid Atlantic. Through our "Try Before You Buy", we'll even put half of your rental fee towards the purchase of the rental item.